When Anthony and I were hiking through the incomparable Torres del Paine park in southern Chile, we played a game we dubbed "the ugliest view." We would stop in a random spot -- not a scenic view point -- and turn around till we found the ugliest view. Then we would frame it, as if taking a photo, and proclaim, "Yup. Anywhere else in the world, this would be the view people came to see." We have that same feeling sometimes in Paris. On a regular basis, we see things that are grand, amazing, old, historically interesting, and....completely ignored by everybody. They don't appear in tour books, and even the locals pretty much just walk by, taking them for granted in the landscape. For instance, have you ever heard of the Eglise de la Trinité (Trinity Church) in the 9th arrondissement of Paris? Or Saint Julien le Pauvre or Saint Severin in the 5th? Of course not. You've heard of Notre Dame, of Sacré Coeur, and maybe (just maybe) even of Saint Sulpice and St. Eustache. Meanwhile, we pass by Eglise de la Trinité and echo the new version of our family game: "If this church were in the US, would it be a big tourist site?" You bet it would. Eglise de la Trinité (also sometimes called Eglise de la Sainte-Trinité) was first built nearby in 1852, then moved a few hundred meters over in 1861 to make room for the new city plans of Baron Von Haussman. The construction was finished in 1867, measures 90m long, 34m wide, 30m high inside, with a 65m high bell tower, and looks like a wedding cake. When you're standing at Notre Dame, which you're bound to do at least once as a tourist, there's something I like to call the "Mona Lisa effect", which is to say that everybody's standing there taking photos of the cathedral, with their backs firmly turned to a building that -- anywhere else -- would be magnificent in its own right, and the thing you came to see: in this case, the Prefecture de Police, originally built from 1863-1867 as barracks for the Garde Républicaine (National Guard). Heck, if either of these buildings were in San Francisco, they would be practically ancient. So you can only imagine what a big deal it would be if an actually ancient building were over there. Saint Julien-le-Pauvre, for example, is actually the oldest church in Paris, older even than its 850-year-old neighbor, Notre Dame. It was first built here in the 6th century, vanalized by the Normands in the 9th, and turned into a monastery in the 12th, at which point the current incarnation of the church was built. Dante and Thomas of Aquinas were said to have frequented the church. Saint Severin, where the girls and I have all sung and performed (and where my hair has caught on fire, and I have nearly fainted), is based on the spot of a 6th century basilica, built upon the death of a religious hermit who lived there. In the 11th century, it was destroyed by the Vikings, and reconstructed in the 13th and 15th centuries. One of the bells for the church, named Macée (in the tradition that French church bells are named), was made in 1412 and remains the oldest church bell in Paris. And, let's face it, it has to be one of the older ones still in use in the world. Eglise Saint-Paul-Saint-Louis was built in the 1600s, under the order of King Louis XIII. In the back of the church is the largest remnant of the outside walls of Paris built by King Philippe Auguste, in the late 1100s. It's not protected by plexiglass or watched over by guards. There's no admission fee. It simply serves as the wall of a playground, and is often used to bounce back soccer balls. What about the ducal palace called the Hôtel de Sens in the Marais constructed between 1475 and 1519? It's now the Forney Library for art and architecture, and I can almost guarantee you've never heard of it, unless you've toured around the Marais with me or read about it on my blog, since I am, frankly, in love with this building and point it out whenever I can. If I could live in any building in all of Paris -- ideally, I'd have the whole place to myself -- this would be my fantasy house. And yet, you've never heard of any of these churches and buildings. You've never visited them, learned about them in books, or even, perhaps, noticed them as you walked by. But one of the great luxuries of living here for many years is that we have time to delve deeper than the most obvious tourist sites; bit by bit, we're noticing them. The trick is to take the time to notice them, but not to spend so long here that they become part of the backdrop. Even after four years, the wonder hasn't worn off for us, and we consciously try to appreciate how marvelous and miraculous buildings of this size and scope, built in the 1800s, 1600s, 1100s, and before (! ), would seem back in the US. Chèvre Frais is a rather generic name -- Fresh Goat Cheese -- but in this case, it's made a little more unusual by the addition of "basilic" -- "basil". This particular version is a raw goats' milk, farmhouse cheese from Perche, the historical name of an area that in modern times is spread around the Pays de la Loire region. This is, as the name suggests, a very fresh, young cheese, barely molded and full of liquid. That means the texture is more akin to a fluffy mousse than a thick and creamy cheese. The flavor is tangy both from the goat and the freshness. It's almost like the zip of yogurt, with a hint of lemon, along with the herbs in the mix. It's a wonderful cheese on a summer day -- light and refreshing. The word for a basilica in French is "basilique", pronounced exactly like "basilic" (ba-zee-LEEK), the herb basil. 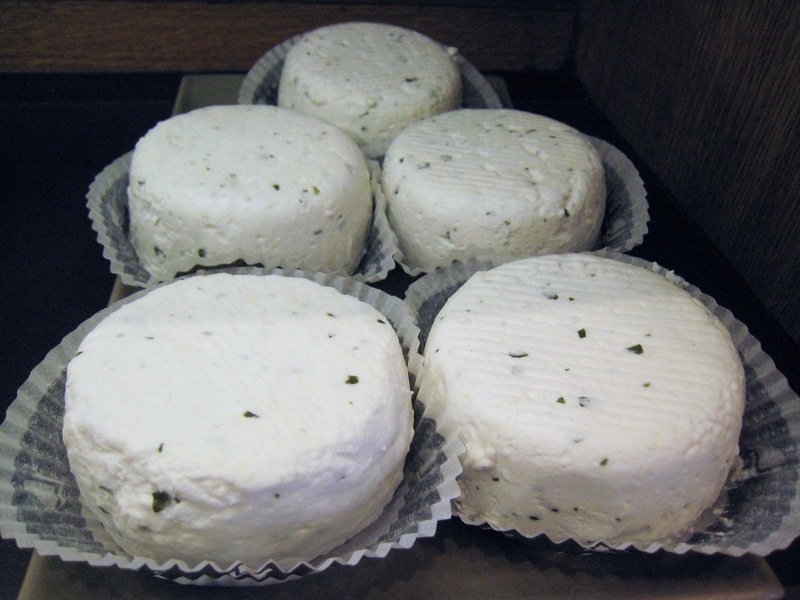 In this case of Chèvre Frais Basilic, you do notice the basilic that flavors the fresh cheese. On the other hand, walking around Paris, you probably will not notice many of the basiliques and buildings that would be incredible any place else in the world but here in Paris are just overlooked and humdrum.